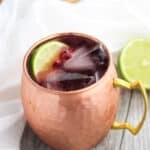 This Pomegranate Moscow Mule is an easy, fresh twist on a cocktail classic. Tart pomegranate juice adds an extra flavor along with ginger and lime, and it gives this drink a pink hue! Pour all ingredients over ice and stir. Garnish with additional lime wedges and/or pomegranate arils.